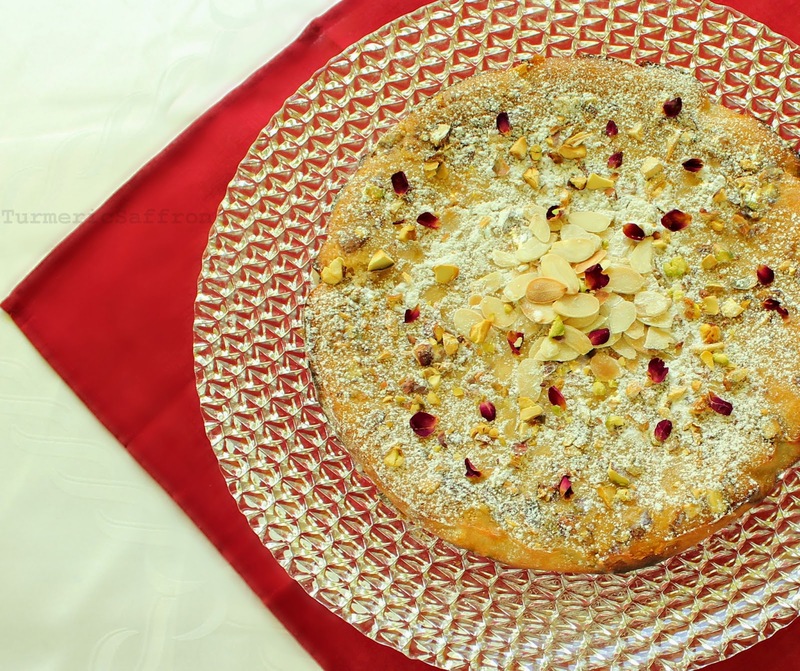 A few years ago when I was just starting to blog about the food of my heritage, I came across an image of "Persian Love Cake," a chiffon cake with a few pink rose petals scattered about. My first reaction was: no way, how come I've never heard of this before?! Where was I all that time growing up in Iran when everyone else was eating کیک عشق - cake-e eshgh? After my initial surprise I realized there was no need to worry and that this was a newly created concoction of aromatic and flavorful classic Persian ingredients. I figured since the combination of saffron, rose water, cardamom and lemon zest transforms a simple cake into a magical Persian love cake, then we Iranians have been consuming a whole lot of love for the past several centuries! I may have been taken aback by discovering that there's a Persian love cake, however I wouldn't be surprised if Persian food in general were to be called a love cuisine! Much love goes into mastering the art of simmering stews into glorious deliciousness using fresh seasonal ingredients, putting just the right amount of salt, pepper and a few spices and steaming the rice to a fluffy perfection with a golden crunchy tahdig - crust. I can easily call salad shirazi a love salad, fesenjoon a love khoresh or zereshk polow a love polow and I think, we should call it a love menu! In addition to my passion for Persian food, which is clearly evident in this very personal blog of mine, I have also developed a passion for Persian poetry over the years. Persian poetry is as fragrant as drops of rose water in the air, colorful as saffron threads and flavorful as cardamoms in their pods. 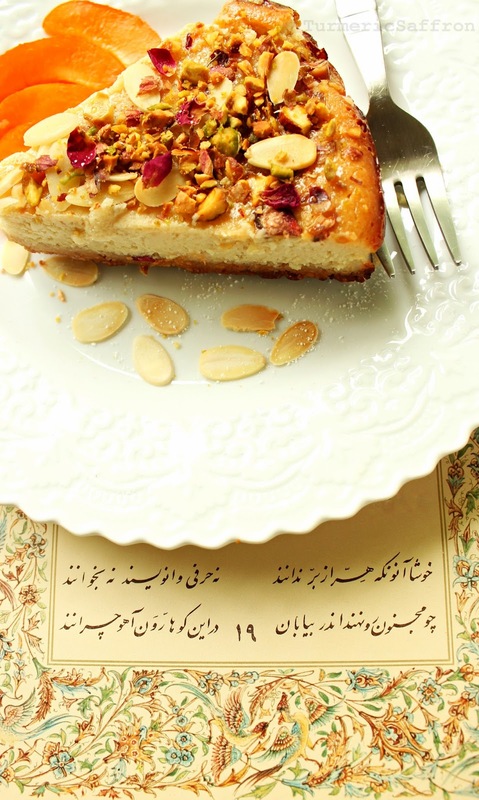 That's what you get when an Iranian food blogger writes about Persian poetry! Among many of the poems that I grew up with there are a few that have made an everlasting impression on me and are my favorites. I am a firm believer that love is the power that connects and holds all the particles together in this world even in the darkest and most challenging times. On the day of making a covenant with Adam's generation, "Love" among all other particles was looking for us. This is enough for me that everyone, friend or foe, will say this woman was among his bidders. The next poem or rather a line of a poem is by Hatef Esfahani known for his ghazals (ode) and tarji- band (recurrent verse) style of poetry. However, I would like to take the liberty to say that for me this poem stands alone by itself as the best of the best to describe the mood and the feeling of someone's love and devotion and it has to be read several times over and over to feel the rhythm and the beat embedded in the words. Perhaps, one day I'll come back to this post and write a translation for it but so far I am at a loss for words to capture the essence of it. Therefore, I'll leave it without the English translation. My sincere apologies. 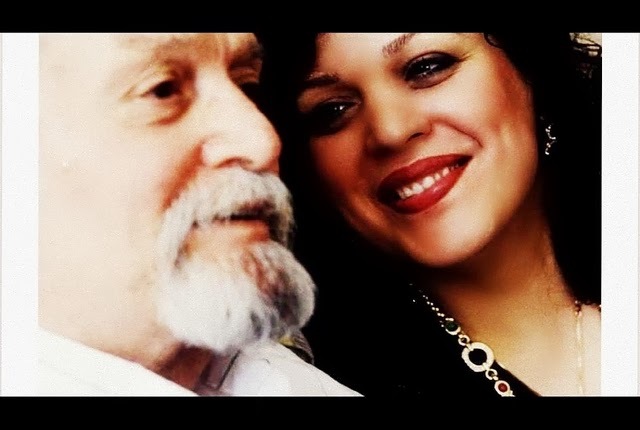 I haven't written about my father as much as I have written about my mother. One reason could be that I didn't spend much time with him growing up or rather he didn't have much time to spend with us since he was always working so hard and was away from home. I was also long gone by the time he retired. I don't think I ever got a chance to know him completely and it's interesting that all I've learned about Baba's family history, childhood and upbringing was through my mother! Baba was a fairly quiet man who had suffered from many physical ailments throughout his life. I clearly remember my last long distance phone conservation with Baba right before his passing. I had gotten the terrible news about my father's deteriorating condition. Devastated, I called home and asked to have a few words with him even though I was told he couldn't speak coherently. Still, I needed to hear Baba's voice. I asked my mother to place the phone next to his ear and I started to plead with him to say something, anything, that I just wanted to hear him. His last few words were: work on your heart and polish it into a jam-e jahan nama (a crystal globe that reflects the world). These were Baba's last words, a short message of a self-realized life lesson that spoke volumes and showed me the depth of his love for his child on his last breath and for that alone I am forever indebted to him. For this recipe I had a couple of options, the first one was the chiffon cake with rose water icing and candied rose petals. The second option was a simple almond cake. I chose the second version simply because it tastes more like the kind of sweets I grew up with, no-frills and downright delicious. I've tweaked the recipe a little bit. 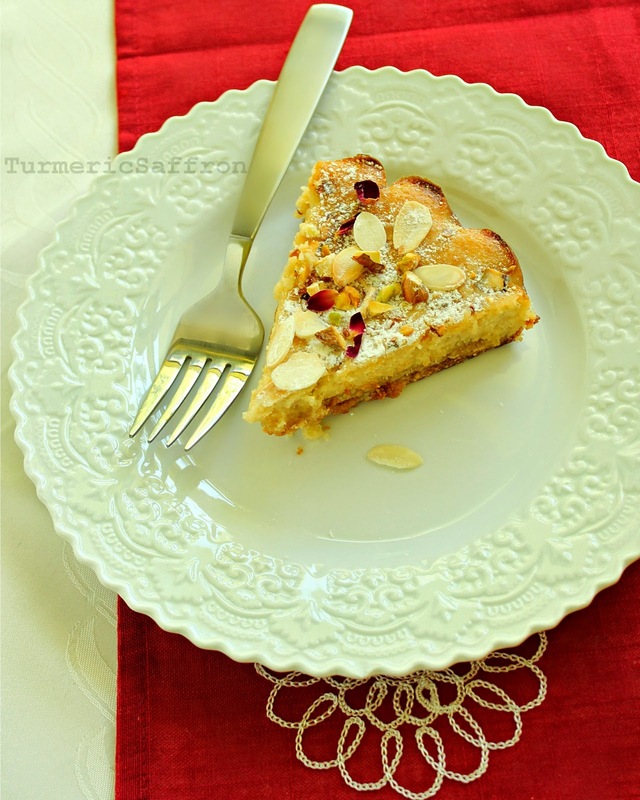 Please see my Pinterest link for more Persian Love Cake recipes. Preheat the oven to 350 degrees Fahrenheit. In a large mixing bowl combine almond meal, sugar, butter and salt. Mix thoroughly by hands. Generously butter the bottom and sides of a 9- inch springform pan. Line the bottom of the pan with parchment paper. Divide mixture in half and press half of the mixture evenly into the bottom of the greased pan. Beat the eggs lightly and add to the remaining almond meal sugar mixture. Add yogurt, lime zest, lime juice, cardamom and rose water and using a wooden spoon mix all ingredients together until well blended. Pour the creamy mixture over the prepared base in the pan and using a small spatula smooth out the surface. 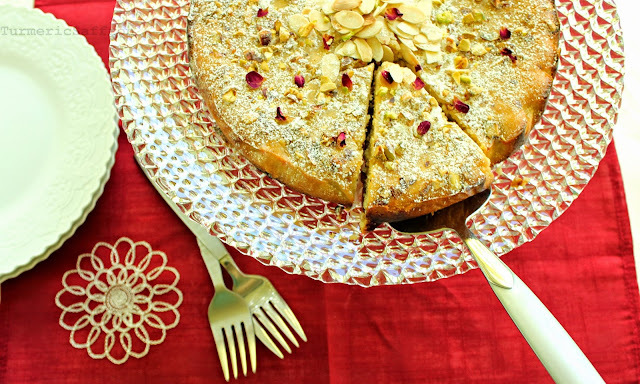 Sprinkle the chopped pistachios, sliced almonds and rose petals on top or however you want to decorate. It's your love cake! Set the cake on the middle-rack of the oven and bake for about 30-35 minutes or until center is set. 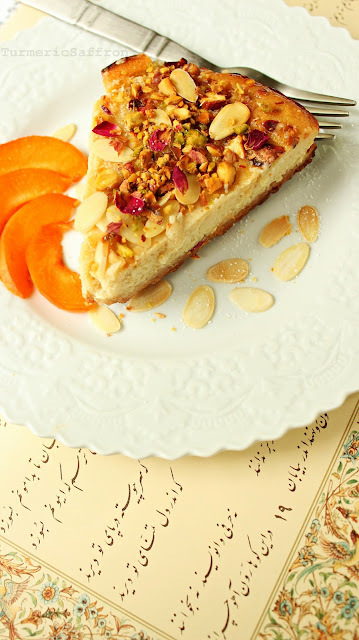 Transfer the Persian love cake onto a serving platter, slice and serve with a dollop of strained yogurt, some fresh sliced fruits and a hot cup of chai.